This is our most popular business package. This system offers the widest opportunities by including the complete engraving and sandblasting packages. Plus a lot more ! 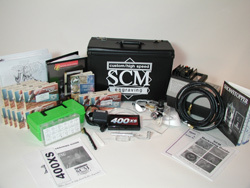 Exposure System, Photo Image Film, Application Adhesive, Trigger Jet, Sandblasting Videos, Photo Image Instructions, Art Library, and Vellum. 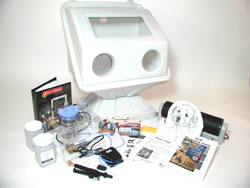 Blaster Pen, Tungsten-Carbide Blasting Nozzle, Complete Jet Stream Blaster Cabinet, Exclusive DVD/Video Training Program , Instruction Manual. The beautifully crafted portable dust collecting system will allow for a virtually dust-free engraving environment. SCM's dust collector includes Plexiglas shields and variable speed fans that draw up to 720 cubic feet or air per minute past your work. Over 90% of even the finest carving debris will be collected. Overall dimensions are 8" x 10 3/8" x 23"
Weddings, wood plates, egg shells, baseball and other sports, knives, gun stocks, perfume bottles, holiday, corporate awards, and scrimshaw. Two professional brochures to aid in your sales presentation. A general 4-color brochure - perfect for the wedding, gun, knife, and egg markets. A 32-page 4-color gift and awards catalog also ! A Car is Stolen Every 20 Seconds ! With auto theft on the rise, businesses that focus on theft prevention are becoming more successful. This has made the Silent Security System extremely profitable for those individuals looking for a business of their own and established companies looking for additional services. The vehicle identification number (VIN) is engraved in the corner of every window of the automobile. When a car thief steals your car, the first thing they do is change the VIN. Now that the number is permanently engraved in the window, they have to change every window ! This is a very time consuming job (6-8 hours), not to mention the cost ($1500). The thief will move on to an unmarked vehicle. Vehicle Stickers - 100 adhesive stickers for marking cars. Carrying Case - Attractive case to carry you materials.